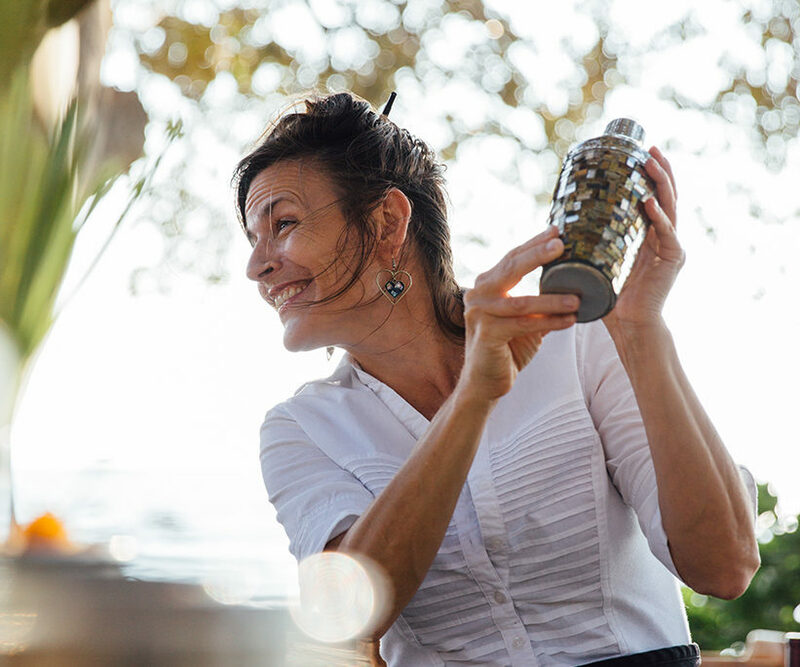 One of Maui’s most celebrated and enduring culinary innovators, Bev Gannon has secured herself as one of the consistently rated Top Chefs on the island. 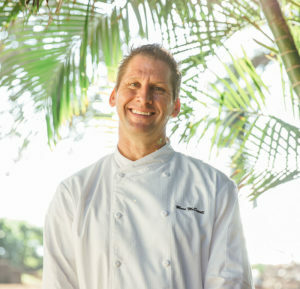 As chef/owner of Hali‘imaile General Store in Upcountry, Joe’s in Wailea, Gannon’s in Wailea and owner of the longest-running catering company on the island, Celebrations by Bev Gannon, Bev is perhaps best known to local foodies as one of the 12 original founders of the Hawaii Regional Cuisine Movement which champions the concept of using fresh local ingredients in island menus rather than importing ingredients from out-of-state. 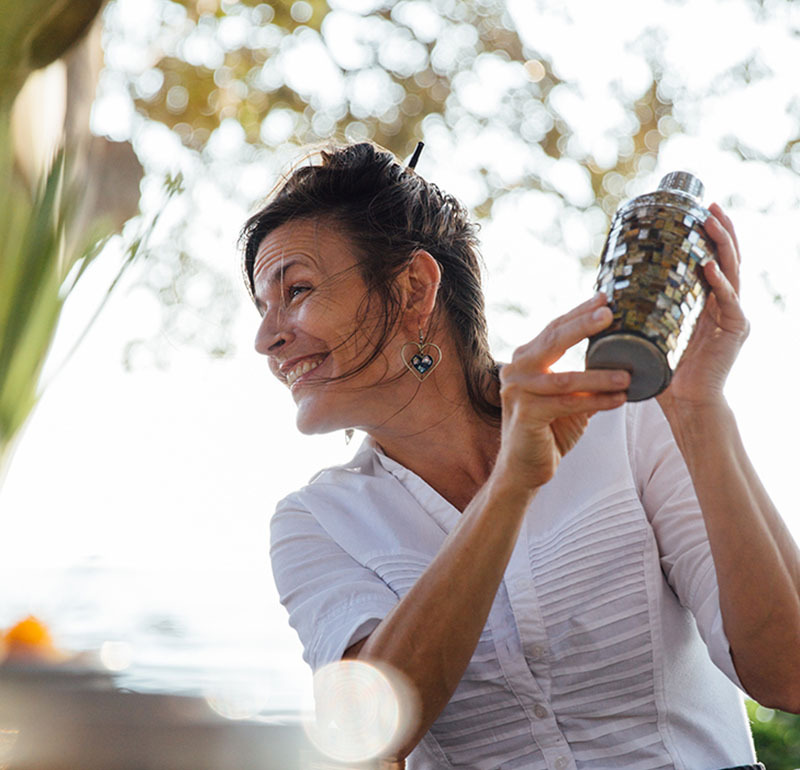 The recognition that Bev has gained for her island-influenced dishes has built a following of critical acclaim both locally and across the country including a 2004 nomination for the prestigious James Beard Award for “Best Chef Hawaii/Pacific Northwest”. Chef Bev takes pride in creating one of a kind custom menus that can reflect her clients tastes as well as carefully designed dishes that look and taste amazing. 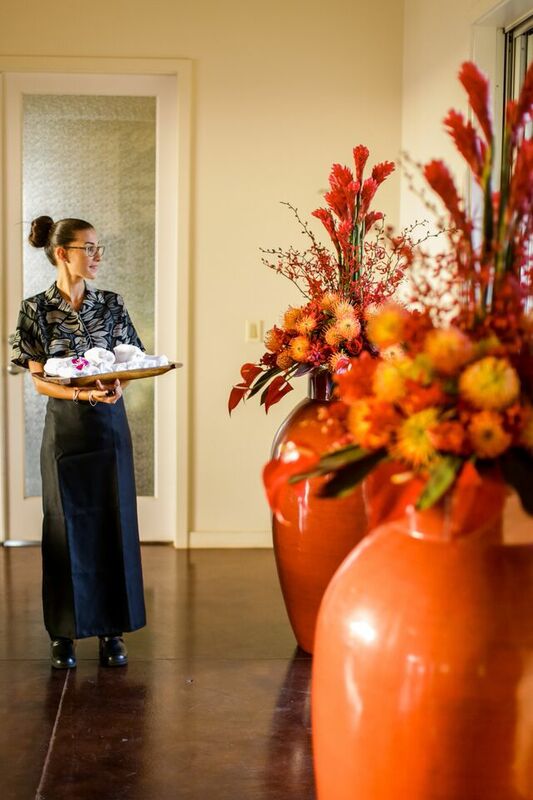 Deborah has over 30 years of hospitality experience, most recently as the Event Manager at Morimoto Maui. 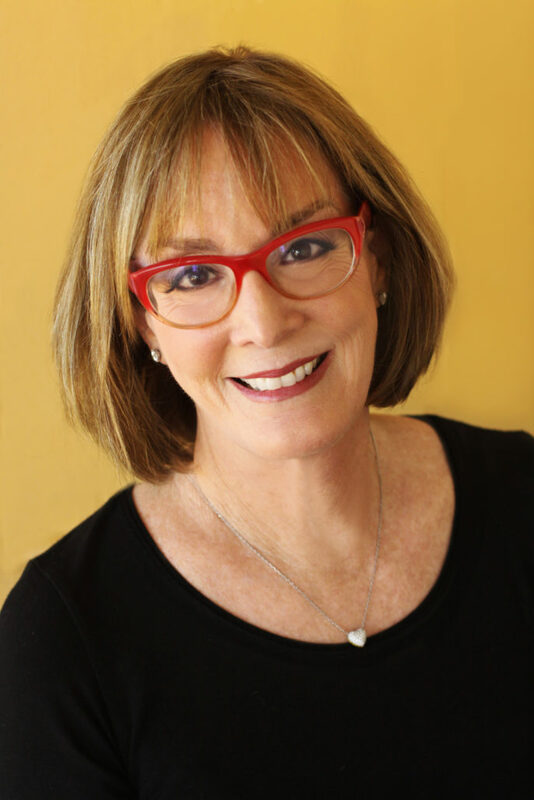 Prior to that position, Deborah worked for Hyatt Hotels for over 15-years. Most recently as a Convention Services Manager at Hyatt Regency Maui. She holds a Master’s Degree from Institut de Management Hotelier International, a program jointly administered by Groupe ESSEC and Cornell University, located in Cergy-Pontoise, France. 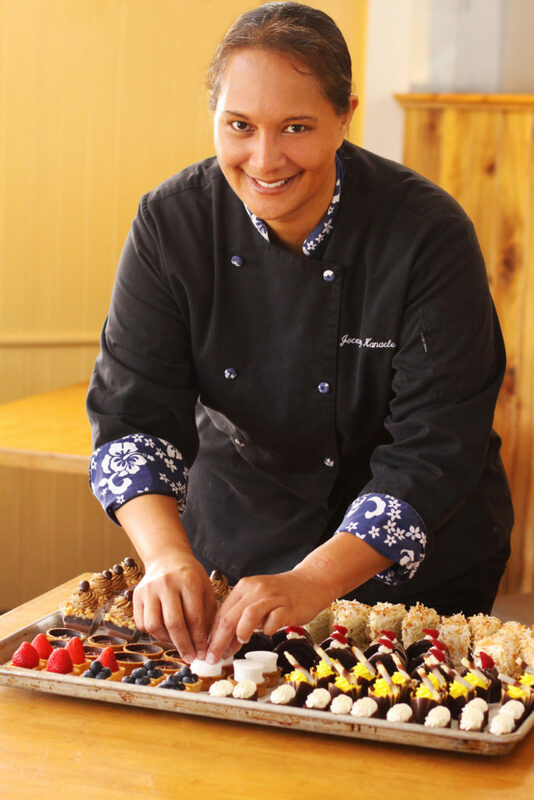 Jocelyn Kanaele is a professional Pastry Chef born and raised in Haiku, Maui. She began her career in 1992 working at Four Seasons Hotel in Wailea until 2001. 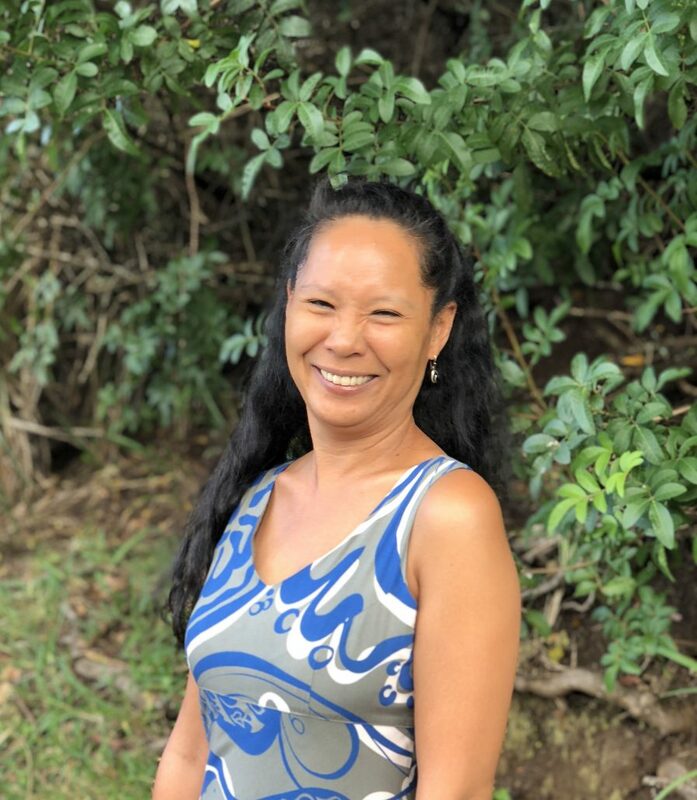 She also worked for local bakeries on Maui, moved to Oahu worked for Roy’s in Hawaii Kai, Halekulani and then returned to Four Seasons in Ko’olina. She specializes in all occasion cakes from weddings, anniversaries to birthdays and also graduation. Preparing small delectable bite sized treats, chocolate candies and confections, and many local favorites to include cream puffs, butter mochi, poi mochi, homemade malasadas just to name a few. She can also customize any dessert or cake to your preference. I don’t write testimonials very often, so that alone says a lot about Celebrations Catering. They just make life easier! When I was planning a surprise engagement dinner I enlisted the help of Nicole Scharer and she guided me through every specific detail. Never once was I stressed or overwhelmed. And when it came time to indulge in the amazing dinner we planned it surpassed all that I expected. I cannot recommend Celebrations Catering enough. For a quiet dinner for two or a party for hundreds, they always blend in and create an unforgettable evening. We just wanted to say thank you so much again for everything you did to help us with the Middleton wedding this past week. It was quite a roller coaster, but you were our biggest ally, and we are so grateful. Your constant positive attitude and willingness to make anything work was such a huge support for us. We are truly so thankful for all you did, and your food was absolutely delicious as well. It was a huge success and that is thanks in large part to you. Please thank Nicole for us as well as she was also wonderful to work with! We look forward to working together again, and hopefully in the near future! We cannot begin to tell you how much we appreciated your input in making our dinner party a success. Nicole was a “force of nature”. She is not only extremely competent, but also innovative and organized. Her leadership skills and presentation skills are very impressive. The food was delicious! The pumpkin cheesecake was everyone’s favorite. It was equally delicious for dinner and for my breakfast the next day. Of course, everyone wanted the fish! You are so kind and gracious to rescue us, especially during the busiest week of the year. It was the party of the Century! He had a wonderful time. The flowers, entertainment and food were “over the top” but best of all was meeting so many great people like your mother… So gracious, lovely and fun. I cant imagine how much work went into the planning and it all paid off. When we decided to host 3 VIP industry nights to introduce our new Elvis tribute show in Maui, Burn’n Love, Bev was the first person I thought of to handle the catering for these important nights! 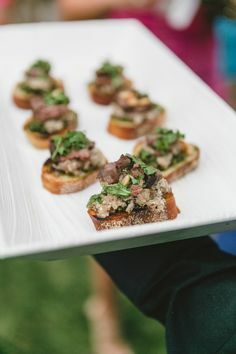 I have partnered with Bev for many corporate events in Maui, and as soon as we mentioned that Bev was catering our VIP nights, the RSVP’s started rolling in! 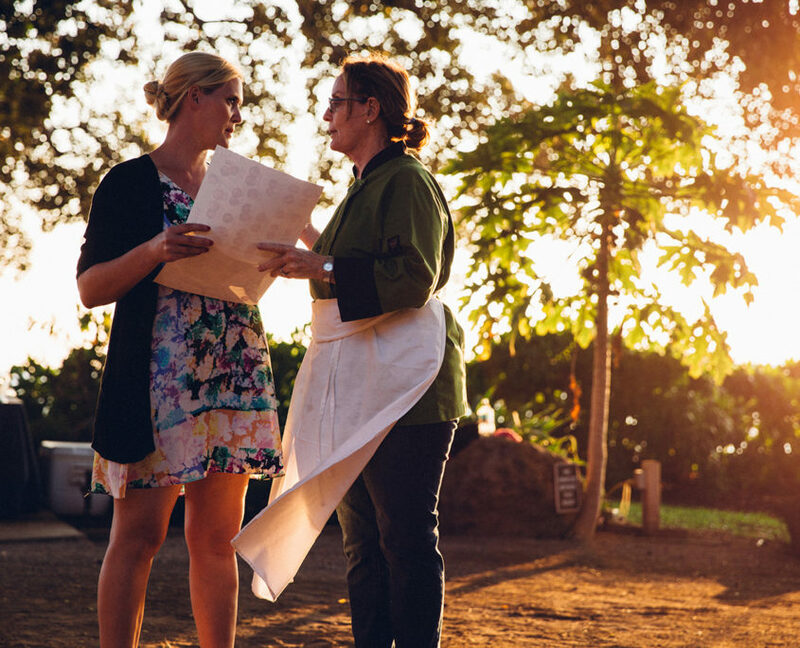 We wanted to associate our first class show , which is the #1 activity on Maui by Trip Advisor, with a first class chef, and that is why we chose Bev. Not only was the food done in true “Southern Maui” style, the service of the staff was exceptional. I asked Bev to create a menu that Elvis would have enjoyed, combining Southern favorites but with Bev’s magic touch, and it was a true masterpiece! Celebrations Catering provided us with exceptional service, outstanding attention to detail and delicious food! Great Job, we will be looking forward to our next Celebrations Catering event. Thank you for providing such a beautiful wedding. The food and display were incredible. Your attention to detail made us feel very taken care of. Everyone was so impressed. It was such a perfect day all around and thank you again for making our reception dinner perfect. The food, drinks and decor was perfect! We will definitely stop in next time we are home for some ono grinds and will for sure say hello. After years of dining at Bev Gannon’s restaurants on Maui I knew there was only one person I would wish for to cater my wedding. I was extremely excited to learn about Celebrations Catering. I was planning a wedding from the mainland and wanted to know that I could trust those working on the wedding. From the moment I contacted Nicole I knew that I had made the right choice. I had helped many friends plan weddings and had seen the different options they had when picking their wedding menu. I remember asking Nicole what the different menu options were and she said, “we have a few sample menus but you really can make it whatever you want.” I was able to take my favorite menu items and make a custom menu for our wedding. The flexibility from the very beginning was a testament to how the rest of our time working together would be. It was convenient and fun to be able to go into Hali’imaile to taste food and cocktails, not much of a task if you ask me! I planned my dream-wedding menu and I was beyond excited. As the wedding came closer, Nicole and Celebrations catering were so responsive and helpful regarding everything we asked of them. Just before the wedding there were a few loose ends that were definitely not their responsibility, but they jumped right in and took care of them. On the day of the wedding everything looked amazing and I never had to worry about a thing. From the welcome cocktail, to the appetizers, to the dinner, and then dessert bar I can honestly say everything was better than I could have asked for or imagined. We were also lucky enough to have Bev Gannon as our chef, which was just icing on the cake! My wedding guests still continue to talk about how wonderful all the food and drinks were at our wedding. The food was the same quality if not better than going into one of Bev’s fabulous restaurants. It was an absolute pleasure and privilege to work with Bev Gannon and Celebrations Catering. If I ever have any other event or party on Maui, I know who I am calling! Over 2 years ago I attended a wedding of a friend’s on Maui and while at the wedding, the father of the bride, knowing I was engaged and getting married on Maui as well, pulled me aside and said if there is anything I can definitely recommend you use for your wedding, it would be Celebration’s Catering and Nicole Scharer as your wedding planner. Because I know this family very well, and I know how high their standards are, I jumped at the opportunity, met with Nicole a few days later, and began the wedding process with her from there. I was blown away from the start. Nicole has a quality that not a lot of people in the service profession have and that is intuition. Nicole seemed to know my vision and goal from the start better than I did. She was able to come up with ideas, creative suggestions, little details, and so much more that only enhanced and complimented the direction I wanted to take the wedding in. I consider myself a creative person but Nicole’s creativity floored me! Throughout the entire wedding planning process Nicole was available to me, generous with her time and energy, attentive, thoughtful and very dedicated to me and my wedding goals. 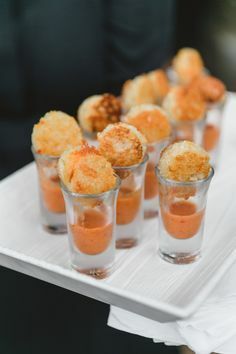 Nicole and Celebration’s Catering helped me come up with a look and feel, as well as a menu and customized bar menu, that literally blew me, my groom, our families and friends away! The attention to detail that was present in the food stations, as well as the bar, was incredible. We served over 40 food items at our wedding and every single one of them was flawless. Our guests went back for seconds, thirds, and sometimes even fourths because the food was just that good! The service was exactly as service should be; quick, efficient, and virtually unseen. Every staff member that came with Celebrations was professional and willing to help. The food and dessert were truly out of this world and my only regret is that I didn’t take more time to try every single thing! My groom even went so far as to request cronuts (a very difficult pastry that uses croissant dough but fried like a doughnut) and for most of our guests, this was the first time they had such a special treat. I heard the next day that some people had 4 or 5 of them because they literally were that good. Honestly, I could go on and on about how happy and thrilled I am for having hired Nicole and Celebrations’ Catering to plan and create my wedding. It was the most beautiful wedding I have ever seen, everything was flawless, and the service was phenomenal and this was entirely thanks to them. 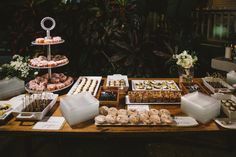 We recently had the pleasure of being married in Maui this past September and used Celebration Catering for our big day. From our very first interaction with them we experienced nothing but the highest level of service, care and professionalism. They were in control of every single detail and left us completely at ease for the most important day of our lives. Words can’t describe how happy we were with Nicole and her team at Celebrations. And the food…..wow. Don’t even get me started. If food means as much to you as it does to us you will be in awe of what they’re capable of. 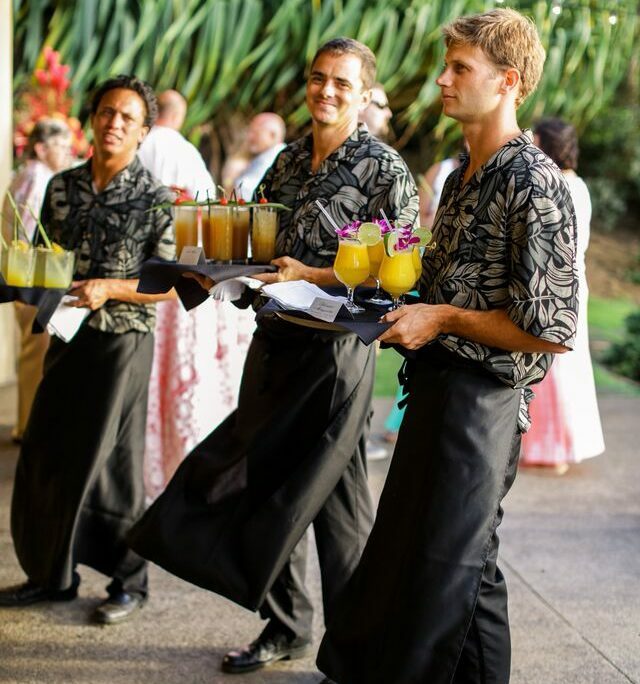 If you are looking for a catering company for your event please stop looking right now, you will not find anyone better in Maui or Hawaii for that matter. Celebrations created a beautiful, memorable experience for our wedding celebration. 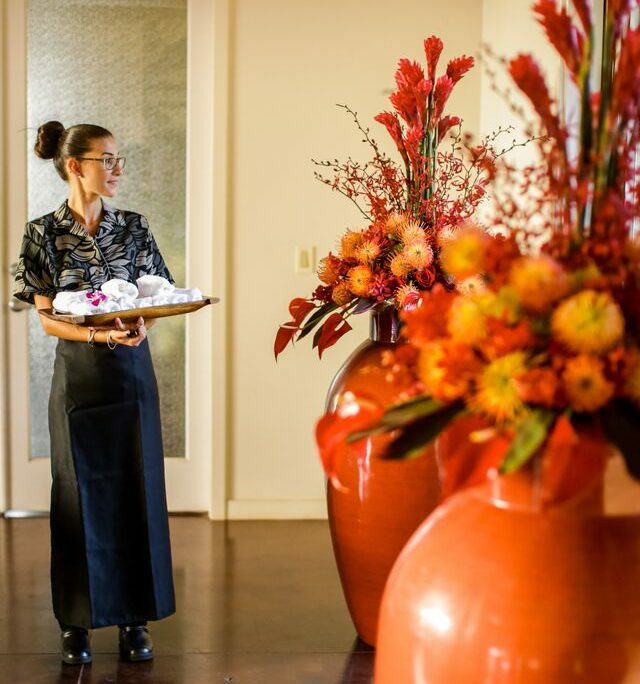 Every detail of our reception was perfect, from the delicious food stations and whimsical cake to the tropical flowers, bar / table service and live entertainment. The presentation of the food stations was exquisite. We still have guests comment on the variety and quality of the food served, how amazing it tasted and how well it was presented. The lighting of the entire event was magical. It created the perfect setting for breath taking photography. We would definitely recommend Celebrations for any Catering event. Working with Celebrations was truly a pleasure! Working with Celebrations was truly a pleasure!! From the incredible tasting to the planning and design, Nicole NEVER skipped a beat. My daughter and I did not have a single concern knowing Nicole was at the helm. Her genuinely thoughtful suggestions were always spot on. Her communication was targeted and intelligent. 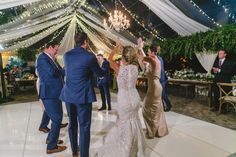 The wedding day execution did not disappoint and guests continue to rave about the incredible food….it is NOT typical wedding food- it is a million steps above! My only regret is that i did not use Celebrations to oversee the entire wedding planning. I strongly encourage anyone planning a wedding in HI to consider working with this professional group. Amazing! If I could give 10 stars, I would! I used Celebrations Catering for my wedding for food, cake, rentals and bar, and they were worth every penny we spent! Seriously, I can’t rave about them enough. Professional and attentive, they were totally unobtrusive at the wedding. Most importantly (for me anyway) the food was unbelievable! People are still raving about their Hoisin Braised Short Ribs, their Lilikoi Mojitos and the cake! Almost a year later, we still have guests reminiscing about the cake. Moist and totally delicious. 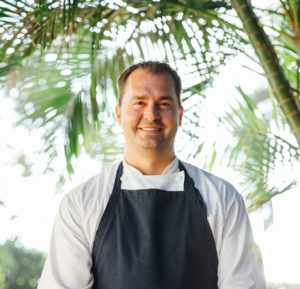 Hands down best caterer and wedding planner on Maui! 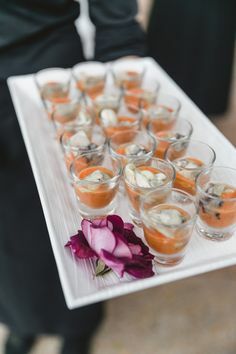 Over 2 years ago I attended a wedding of a friend’s on Maui and while at the wedding, the father of the bride, knowing I was engaged and getting married on Maui as well, pulled me aside and said if there is anything I can definitely recommend you use for your wedding, it would be Celebration’s Catering and Nicole Scharer as your wedding planner. Because I know this family very well, and I know how high their standards are, I jumped at the opportunity, met with Nicole a few days later, and began the wedding process with her from there. I was blown away from the start. Nicole has a quality that not a lot of people in the service profession have and that is intuition. Nicole seemed to know my vision and goal from the start better than I did. She was able to come up with ideas, creative suggestions, little details, and so much more that only enhanced and complimented the direction I wanted to take the wedding in. I consider myself a creative person but Nicole’s creativity floored me! Throughout the entire wedding planning process Nicole was available to me, generous with her time and energy, attentive, thoughtful and very dedicated to me and my wedding goals. 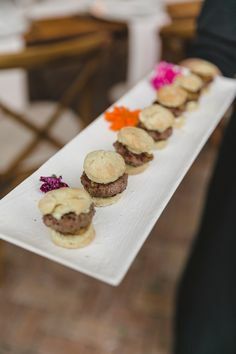 Nicole and celebration’s catering helped me come up with a look and feel, as well as a menu and customized bar menu, that literally blew me, my groom, our families and friends away! The attention to detail that was present in the food stations, as well as the bar, was incredible. We served over 40 food items at our wedding and every single one of them was flawless. Our guests went back for seconds, thirds, and sometimes even fourths because the food was just that good! The service was exactly as service should be; quick, efficient, and virtually unseen. Every staff member that came with Celebrations was professional and willing to help. The food and dessert were truly out of this world and my only regret is that I didn’t take more time to try every single thing! My groom even went so far as to request cronuts (a very difficult pastry that uses croissant dough but fried like a donut) and for most of our guests, this was the first time they had such a special treat. I heard the next day that some people had 4 or 5 of them because they literally were that good. Honestly, I could go on and on about how happy and thrilled I am for having hired Nicole and Celebrations’ Catering to plan and create my wedding. It was the most beautiful wedding I have ever seen, everything was flawless, and the service was phenomenal and this was entirely thanks to them.